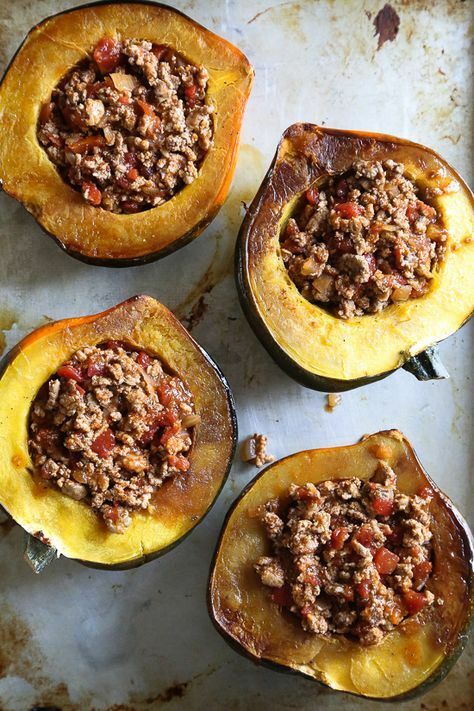 Acorn squash is so easy to make. Just carefully cut it in half, scoop out the seeds and let the oven do the rest. This is a very hearty dish with an autumn flavor that goes beautifully with the chili. There are 4 servings in this recipe. One serving equals a serving of vegetable, a serving of protein and one-half serving of fat. Preheat oven to 400°F. Brush squash with 2 tsp. of oil, sprinkle with salt and pepper, and place halves on the baking sheet, cut side down. Bake 35-40 minutes or until tender when tested with a knife. While the squash is baking, in a large skillet, heat one Tbsp of oil. Add turkey/beef over medium-high heat, breaking into smaller pieces, and season with sea salt and pepper. Add onion and garlic and continue to cook an additional 3 minutes. Add the diced tomatoes, tomato sauce, water, cumin, chili powder, paprika and bay leaf. Cover and simmer on low heat about 25 minutes. Remove the bay leaf. Flip the squash over and fill each half with 4oz. of the meat mixture.